Learn about the graduate programs available without stepping out your door. Graduate Students in the Winterthur / UD Program in Art Conservation (WUDPAC) program working at Winterthur Museum and Gardens. Photographed for a story in the Messenger. Jeff Buler, assistant professor of entomology & wildlife ecology, and students from his master's level seminar in landscape ecology (ENWC667) take a flight in a hot air balloon to get a bird's-eye view of the landscape near Pottstown, PA.
Finance Lab Conference hosted by the Alfred Learner College of Business and Economics in the Exelon Trading Center. The conference brought together educators and directors of financial trading labs similar to UD's Exelon Center to discuss integrating financial software and simulations into curriculum. Choosing a graduate area of concentration can be a challenge. The University of Delaware attracts students with a multitude of interests, which explains why it’s so common to find students pursuing a dual degree or participating in an interdisciplinary program. Whatever your interests, we hope you will take advantage of this online resource to explore the many programs we offer. Use the following choices below to narrow your search as you explore our programs. The objective of the MS in Accounting program is to extend the education of qualified students into advanced study in each of the major areas of the field of accounting (financial, managerial, information systems, auditing, and taxation), as well as in the supporting fields of finance and quantitative methods. The Masters of Accounting Practice is designed for those individuals who did not major in accounting as an undergraduate but who want to pursue the professional practice of accountancy through graduate study and prepare to sit for the Uniform CPA Examination. Initial teacher certification in the areas of agricultural and natural resources education. The Applied Bioinformatics certifice will allow students to gain core competency in bioinformatics for real-world applications ranging from pharmaceutical, health care to agriculture and energy and meet industry’s demand for professionals who have the ability to interpret coplex biological data. FALL: Applications accepted up to first day of classes. SPRING: Applications accepted up to first day of classes. Numerous active mathematical topics, as well as a steady stream of visiting scientists from all over the world. Areas of in-depth study are driven by faculty research and encompass cardiovascular physiology, exercise physiology, musculoskeletal physiology, and neurophysiology. The MS in Applied Statistisc provides a theoretical foundation in probability and mathematical statistics with applied applications in regression; design of experiments; logistic regression and models of counts; and multivariate methods and exposure to various software including SAS, JMP, and R.
A three-year interdisciplinary curriculum designed to educate and train conservation professionals who can carry out the examination, stabilization and treatment of art and artifacts. Offers studies in the history of art from ancient to modern times, with special concentrations in American art and in European art from the Renaissance through the modern eras. The MA in Art History for Museum Professional is open only to UD Art History Majors. The program integrates the requirements of the MA in Art History and the certificate in Museum Studies within one accelerated plan offering both in-depth art historical education and museum training. Athletic Training is a professional preparation program geared toward success on the BOC examination for athletic trainers and careers as a certified athletic trainer. Click here for a informational brochure on careers in Athletic Training. Applications are reviewed on a “rolling” basis upon completion and submission to the Office of Graduate and Professional Education. The program is designed to provide knowledge and experience in developing computational methods and bioinformatics tools and databases for modern biological studies, biotechnology or medicine. The field encompasses the development and application of computational tools and techniques for the collection, analysis, management, and visualization of biological data, as well as modeling and simulation methods for the study of biological systems. Areas of research include fields of physiology; cancer biology, cardiovascular biology; cell and extracellular matrix biology; developmental biology; microbiology and virology; and molecular biology and genetics. The study of human movement and exercise as well as the biomechanical and physiological alterations observed as a consequence of injury, disease, and various intervention strategies. Biomedical engineering applies fundamental engineering principles to the study of biology, medicine and health. Provides advanced, interdisciplinary didactic coursework in the life sciences, training in business applicable to scientific industry and experiential training in an industrial setting. Program is designed to provide the guidance and opportunity for students to develop the quantitative skills of engineering and science, and the acumen to apply these skills for the welfare of modern society. Research areas include analytical, biochemistry, inorganic, organic, and physical chemistry. An interdisciplinary program to prepare candidates with the knowledge and skills needed to teach effectively in the dual language immersion classroom in the areas of linguistic and cultural proficiency, as well as teaching methodology. Current UD undergraduate students can be considered for admission to the 4+1 BCE/MCE or the 4+1 BENV/MCE. A dual degree in the MBA & Master of Civil Engineering programs is available to graduate students. Program areas include the physics of climatology (thermodynamics, radiation, and cloud processes), atmospheric dynamics (forces and flows), measurement (microclimatological methods and instrumentation, remote sensing) and computational methods for data analysis and synthesis. The Department of Kinesiology and Applied Physiology’s master’s degree in Clinical Exercise Physiology provides students with the opportunity to develop an in-depth knowledge and hands-on experiences in preventive and rehabilitative practices for patients with cardiopulmonary, metabolic, and musculoskeletal diseases as well as apparently healthy and low risk populations. Theory and research based program in interpersonal and mass communication with sub areas of study in advertising, political communication and public relations. There is a major industry-wide emphasis on composites manufacturing. In composite materials, there is a critical link between their processing and performance, and design rules for composite materials are fundamentally different than traditional materials. The engineer tailors the material structure at the micro- and nano-scales to achieve the desired mechanical and physical properties; this micro-scale structure is formed during the manufacturing process. Our certificate program is closely aligned with the College of Engineering’s strategic manufacturing research and education initiatives. The new online certificate program will extend the reach of the department’s signature education and research programs in composite materials and the focus on manufacturing aligns the college with the national emphasis on manufacturing. The Certificate Program in Composite Materials is designed for engineering and science professionals who are new to the field of composite materials or wish to expand their knowledge of composite materials. The philosophy of the program is that we increase the capabilities and understanding of the student in a broad range of areas utilizing floating point or symbolic computation for solving medium to large scale problems in computational mathematics, science and engineering. Departmental research strengths include artificial intelligence (machine learning, multiagent systems, planning and problem solving), bioinformatics, computational theory (computational learning theory, design and analysis of algorithms, computability theory), compiler optimization and compilation for parallel machines, natural-language processing, (discourse and dialogue, generation, information extraction, summarization), systems (parallel and distributed computing, grid and volunteer computing, algorithm and architecture design for massive parallelism), networks, (distributed computing, transport layer protocols, mobile and wireless networks, algorithm and architecture design for massive parallelism, networks management, security performance modeling, simulation), graphics and computer vision, rehabilitation engineering (augmentative communication, speech recognition and enhancement), software engineering (program analysis and testing), and symbolic mathematical computation (algebraic algorithms, parallelization), and robotics. Department funding not available for spring admits. Areas of study in Criminology, Deviance, Disasters and the Environment, Gender, Law and Society, Methods, Race, Sociology of Health and Sociological Theory. Study of the design of secure software and systems, security analytics, and secure business systems. The 4+1 Cybersecurity Program provides the opportunity for talented students to complete a Bachelor’s degree and a Master’s Degree in less time. Certificate applications accepted up to first day of classes of a given term. Protect systems and data from malware and infiltration with the 100% online M.S. in Cybersecurity from the University of Delaware. UD is recognized as a National Center of Academic Excellence in Cyber Defense Education by the National Security Administration and the Department of Homeland Security for meeting the federal government’s rigorous standards for cybersecurity education. A computer-based internship program for individuals who are seeking the registered dietitian (R.D.) credential. Approaches disasters from an interdisciplinary point of view and emphasizes theories, research methodologies, and policies related to emergency preparedness, mitigation, management and response. ADMITTANCE STATUS: Applications are now being accepted for Fall 2018 and Summer 2018. The professional master’s degree is designed to provide individuals who have already earned a bachelor’s degree related to early childhood with the additional knowledge of child development and practical experiences. Jointly offered by the School of Education and the Economics Department, the program is a model for training economic scholars and leaders who have a deeper understanding of both economics and education. The Economics programs focus on the application of analytical techniques and economic research in government and private industry. The program is designed to provide secondary and primary school teachers with both a foundation in economic theory and a set of strategies and methods for teaching economics in secondary and elementary schools. The research in the program addresses critical problems in education, develop the understanding of teaching and learning in diverse contexts, and lead to improved outcomes for all learners. Specializations in evaluation, measurement and statistics; literacy and learning problems, mathematics education, and learning science. The Ed.D. program equips candidates with the knowledge, skills, and tools to gather and utilize information effectively in decision-making and problem-solving related to organizational improvement. The Educational Technology program provides the master’s degree candidate with both a theoretical and a practical grounding in educational technology methods and techniques, emphasizing theories of teaching and learning that support these methods. Active areas of research in electrical and computer engineering include cybersecurity, computer systems, network science, big data sciences, machine learning, computational imaging, bioengineering, clean energy, communications, signal processing and controls, computer and sensor networks, electromagnetics and photonics, and nanoelectronics materials and devices. Current UD undergraduate students can be considered for admission to the 4+1 BEE/MS in Electrical and Computer Engineering or the 4+1 BCpE/MS in Electrical and Computer Engineering. A dual degree in the MBA & MS in Electrical and Computer Engineering programs is available to graduate students. Graduate program options abound at the University of Delaware. Our options include dual degrees, 4+1 degrees, certificate programs, interdisciplinary programs, on-line, pathways and learning partnerships. Learn more about these designations below to as you explore our programs. There are major categories of degrees available for Graduate level studies at the University of Delaware that include master’s and doctoral degrees. Earning one of these degrees can take 2-8 years, depending on the level of the degree and field of study. Learn about the graduate programs available through UD Online without stepping out your door. The program guidelines for dual degree programs identify the number of credits required for the combined degree. However, the general standard is that completing a combined program results in fewer number of credits required than if each degree was completed as a separate degree. To be eligible for a dual degree, both degrees must be awarded simultaneously as the total number of credits required is based on the program guidelines for the dual degree. Undergraduate UD students have the opportunity to complete a traditional four-year bachelor’s program plus a master’s program in one additional (+1) year. 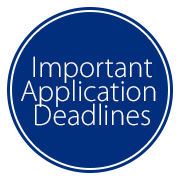 Application deadlines are based on the current year/level of the UD student as they must apply no later than their Junior year (allowing for overlap of graduate and undergraduate coursework during their senior year). University of Delaware offers practical, concentrated study in a specific professional area to help you change careers, explore a new field, gain credentials, and acquire practical new skills and knowledge. The University of Delaware and Thomas Jefferson University offer a reciprocal graduate enrollment program. Full-time graduate students at each institution can attend classes at the partner school at no cost.